These words, from the 92-year-old father of a colleague after he had spent only two weeks in bed in hospital and respite care, will strike a chord with nursing staff everywhere. This issue is the reason why chief nursing officer (CNO) for England Jane Cummings launched a national campaign to end ‘pyjama paralysis’. 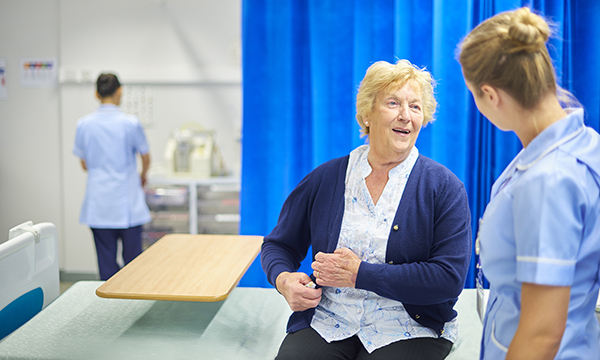 Unveiled at the CNO summit in Liverpool in March, the campaign includes a PJ Paralysis 70-day challenge to get patients up and about as much as possible during hospital and care home stays – an initiative the RCN is enthusiastically backing. At RCN congress in Belfast in May I attended a debate on nurses’ role in reducing the risk of patients experiencing deconditioning while in hospital. The discussion on bed rest and immobility was proposed by associate practitioner David Burnside from South Tees Hospitals NHS Foundation Trust, who spoke passionately about the loss of muscle tone, endurance and function that deconditioning represents. He described the detrimental effects that a ten-day stay in hospital can have. Patients who remain immobile in beds or chairs for the majority of their waking hours often see their average number of daily steps drop from over 5,000 to just 750, he said. Evidence tells us that bed rest can also lead to additional complications, such as increased risk of pressure ulcers, chest and urinary infections, circulatory problems, low mood and loss of self-esteem. As nurses, we know that the therapeutic quality of our interactions and communications can change when patients are dressed in nightwear, as they are less likely to feel assertive and to make their wishes known. What I found encouraging during the debate was the number of RCN members who highlighted the work they are doing locally to combat deconditioning. Iain McGregor from Nottingham University Hospitals NHS Trust spoke of the efforts his trust is making to promote activity, and the positive effect this had on patients and staff. This includes a 37% reduction in falls, an 80% reduction in patient complaints and a decrease in pressure ulcers. RELATED: How can I help older people in hospital get home sooner and prevent deconditioning? While every nurse would agree that preserving a patient’s functioning is an essential part of care, it is not without its challenges. The links to safe staffing numbers are clear: trying to maintain a patient’s mobility and independence requires skill and time, with one speaker explaining it was much quicker to provide a commode than to encourage and support people to walk to the toilet. People entering hospital can do a lot to help nursing staff reduce the risk of deconditioning. They need to understand what they and their families can do to ensure their well-being, with the support of the clinical settings. Passengers about to undertake long-haul flights understand the need for flight socks, good hydration and regular movement. The evidence for reducing deconditioning in hospital is the same, yet we haven’t always capitalised on such messaging. But when patients are encouraged to engage in their own care, we often witness surprising results. Imagine the time that would be freed up if the results achieved by Nottingham University Hospital were replicated across the UK and, more importantly, the reduction in pain, distress and ignominy to the people we serve. Providing direct care is the essence of nursing, but we also need to prioritise our educative role where deconditioning is concerned and provide patients, families, colleagues and the public with the information and skills they need to prevent the harm it causes. Skilled nursing care, delivered by well-resourced and well-trained staff, is what keeps health and social care, and the people it treats, flexible, supple and fit.